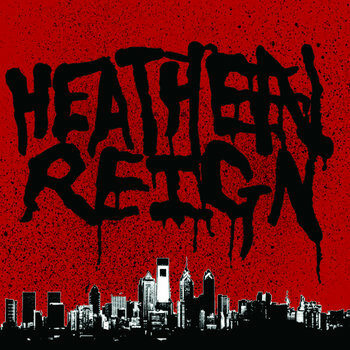 From Philadelphia and featuring members of War Emblem, Heathen Reign have a sound reminiscent of the Louisville early 2000's bands like Coliseum and Lords. I say this due to the rock and roll groove of some these guitar riffs, backed by a very rthym heavy song writing approach. The vocals are powerful and up front, like they were custom made for this music. They are quite a perfect fit to emphasize the intensity. The drumming and bass work is nothing flashy, but provides a sturdy foundation to back up the whole presentation. At times the guitar cuts out and you get a nice view of the dirty, distorted bass tone cruising upon some open drums. My only complaint here is that I do wish the drum sound was a bit more big and roomy sounding. Though, this is a very guitar-heavy mix so perhaps it would have clashed with the band's initial vision. Regardless, good stuff here.